The 2016 election was marked by a clear gender divide. In fact, men and women differed in their voting choice that year more than they had in any other modern presidential election. A year on from President Trump’s inauguration — and the Women’s March protest that filled the National Mall the following day — that gender divide persists. 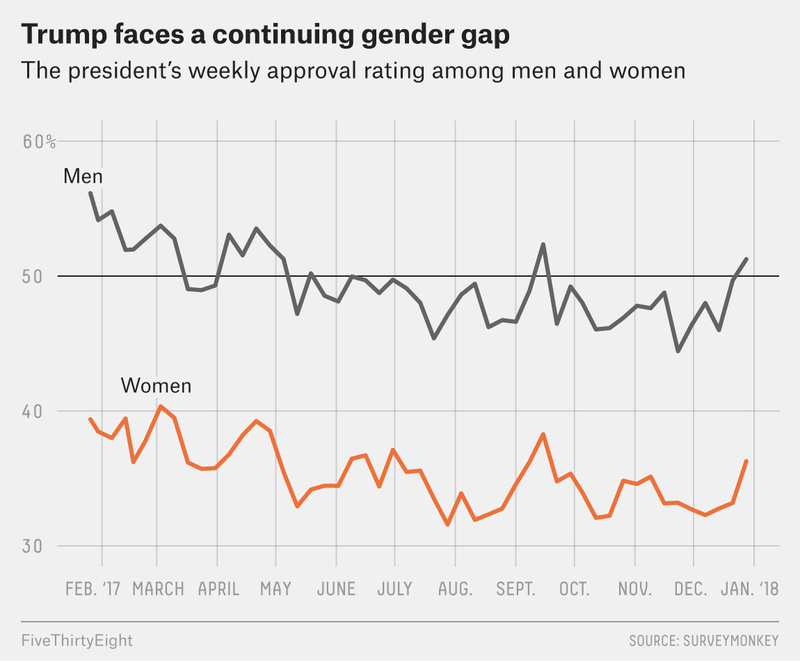 Trump has a lower approval rating among women than men, and that gap has stayed about the same size throughout his first year, according to SurveyMonkey data collected from over 600,000 Americans. When you further divide the results by respondents’ party and race or ethnicity, some of the differences among subgroups have stayed relatively steady while others have changed significantly since the election. In February 2017, 53 percent of men approved of Trump compared to 38 percent of women. That 15 percentage-point difference in approval remained in December 2017. For comparison, the difference by gender in former President Barack Obama’s approval rating in Gallup’s weekly surveys in December 2009 was never greater than 6 percentage points. It’s unfair, however, to look at men and women as monolithic groups. College-educated men and women, for example, were less likely than their non-college-educated counterparts to approve of the job Trump was doing as president throughout the year. Similarly, men and women who live in the Northeast and West were less likely to approve of Trump than their counterparts in the Midwest and South. Perhaps more interesting is the president’s approval rating among various age groups, which has shifted over time. 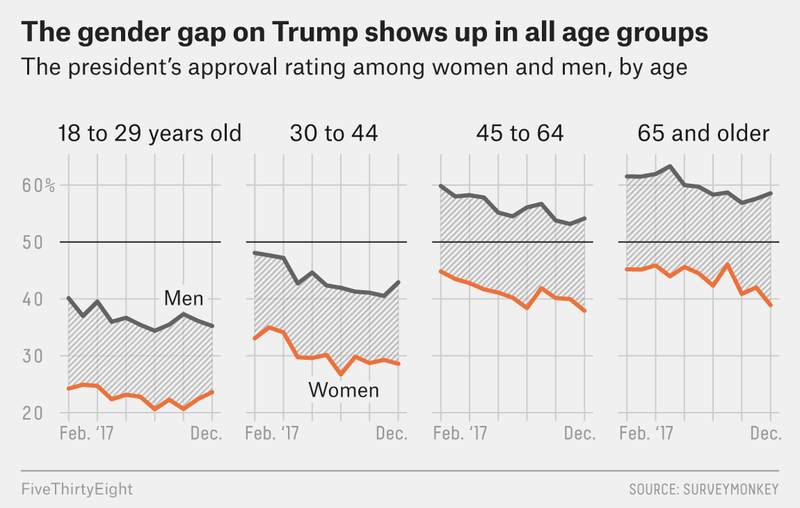 Trump’s approval rating among 18- to 29-year-old women stayed pretty stable during 2017, while women 65 years old and over have soured on him a bit. In fact, the gender gap among young people may have gotten slightly smaller, while it may have grown during the year among those age 65 and up. Across all the monthly averages of Trump’s approval rating since February, December’s 20-point difference among this oldest subset was the largest gender gap of any age group. Not surprisingly, party affiliation also makes a big difference in how men and women tend to feel about the president. 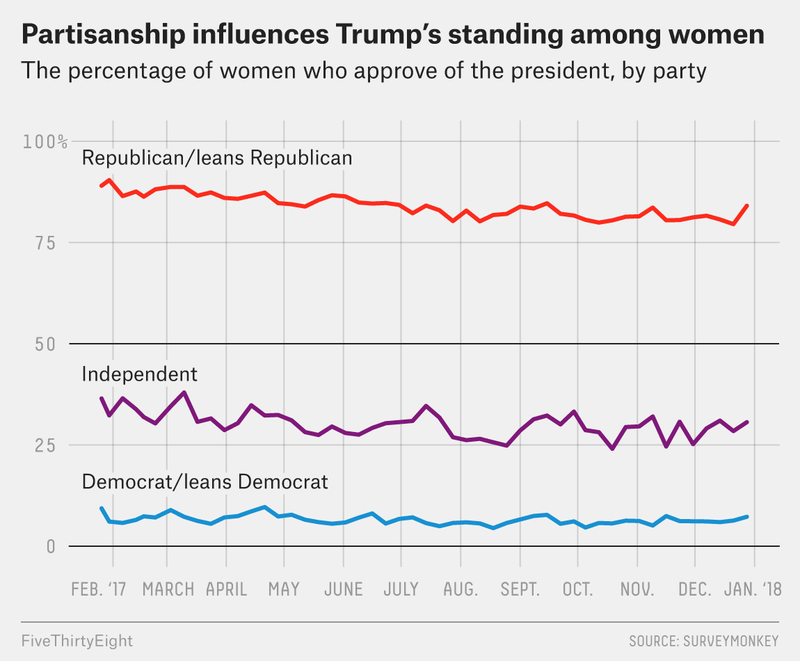 Republican women are, for example, far more likely to approve of Trump than independents or Democrats are, regardless of gender. Yet even when we control for party, the SurveyMonkey data reveals a consistent gender divide. Fewer women in all three political affiliation groups — Democrats, independents and Republicans — approved of Trump than did their male counterparts. That fact that the gender divide remains large even after controlling for party is somewhat unusual. In December 2017, the difference in Trump’s approval ratings among men and women in the same political group was between 3 and 7 percentage points. According to the 2008 American National Elections Study and the 2016 Cooperative Congressional Election Survey, at the end of both George W. Bush and Obama’s presidencies, the gender gap between men and women in the same party1 was less than 2 points in both cases. The fact that Trump does worse among women across the political spectrum suggests that women’s feelings about his policies or personal history are independent of the partisan divide to at least some degree. The SurveyMonkey data also indicates that Trump’s actions may have eaten away at his base. According to the 2016 exit polls, Trump did equally well with Republican men and women. 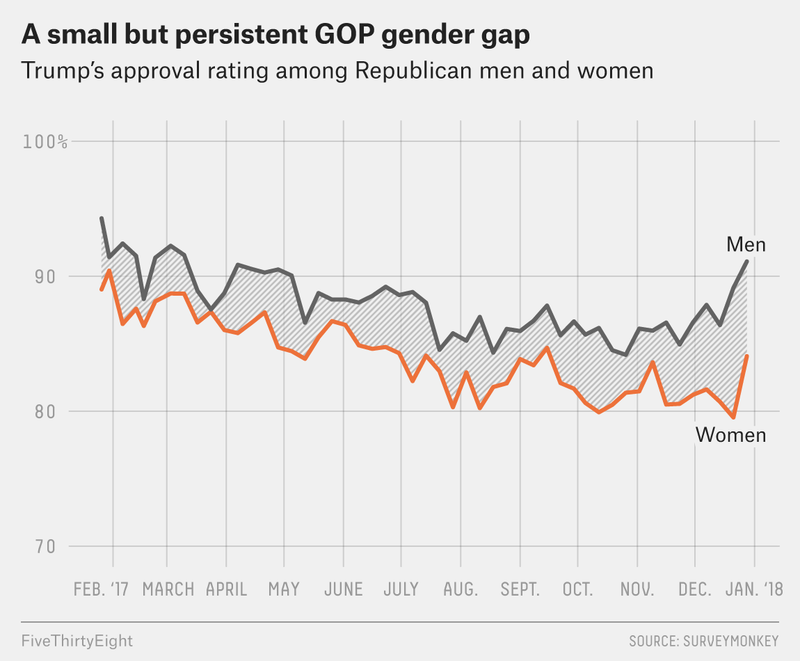 But over the course of 2017, Trump’s support seemed to drop more among GOP women than GOP men. The gender divide also persists even once we control for party and race and ethnicity. In an average of monthly surveys since February 2017, men were more likely than women to approve of Trump for each of the 12 combinations of race or ethnicity (white, black, Hispanic and other) and party (Democrat, Republican and independent). Yet the gender divide is not consistent across all 12 groups. White Democratic men and women are separated by just a point. White independents have a 6-point gender gap. But the largest gulf is among black Republicans. SurveyMonkey interviewed 5,000 black Republicans, and men in that group were by far the least likely male Republicans to approve of Trump — just 68 percent did, compared to 90 percent of white Republican men — but approval among black Republican women is even lower. Only 48 percent of black Republican women approved of Trump’s job performance in an average of responses to polls taken from February through December, which is actually lower than his disapproval rating among this group. That is, even among black Republican women who are sticking by the Republican brand, a plurality — 50 percent — still disapprove of how the president is performing in office. Fortunately for Trump, his lower approval rating among black Republicans doesn’t have a major effect overall, given that black Republicans made up only about 1 percent of voters in 2016. Over the past year, more voters, particularly Republicans, have come to feel that the country would benefit from having women in politics and, overall, voters have spent more time thinking and talking about sexism and sexual harassment in the U.S. In PerryUndem’s most recent survey, published in December, 69 percent of all voters said they thought the country would be better off with more women in office, up 17 points from last year. The biggest jump was among Republican women, 59 percent of whom now agree with that statement, a 31-point increase from the previous year. Republican men also became more likely to support the idea of women in elected office, as 42 percent backed this position in the latest survey compared to 28 percent previously. Yanna Krupnikov, a professor at Stony Brook University who studies political psychology, said the increase could partly be caused by respondents not having Democratic candidate Hillary Clinton in mind when they answered the question in 2017. “When asking that [in 2016], since they’re Republicans, they’re more negative to women in office because they’re thinking about Hillary,” Krupnikov said. But she also noted that media coverage of women who want to run for political office could have played a role in the change, particularly among women, who may have identified with some potential candidates or held similar ambitions. Perceptions of sexism have also shifted. In PerryUndem’s most recent survey, 44 percent of voters thought sexism was a big problem, a 14-point increase from the year before. In addition, a few weeks before the 2016 election, a Washington Post-ABC News poll found that 68 percent of likely voters thought Trump had probably made unwanted advances toward women. Just over a year later, PerryUndem found that 76 percent of registered voters thought Trump had definitely or probably sexually harassed or assaulted women. The same percentage thought there should be an investigation into the sexual harassment and assault accusations against the president. Even among respondents who said they viewed Trump favorably, 43 percent said that the allegations of harassment and assault should be investigated. More broadly, 57 percent of voters in the most recent survey said they wouldn’t tolerate a politician who faced multiple allegations of sexual misconduct even if he or she could pass laws they supported. And almost three-quarters (73 percent) of respondents in the most recent poll said stories of sexual harassment in the news have made them think more about sexism in society. As Trump enters the second year of his presidency, we’ll see if he can bring more Americans together than he was able to in his first year. This data suggests he has a lot of divides left to bridge, including major splits along gender lines. Nationally, Republican women made up 16 percent of the electorate. Trump won 88 percent of Republican women and 89 percent of Republican men. If Trump’s support among Republican women dropped to 82 percent to expand that gap to 7 points, and assuming all those people voted for the Democratic candidate rather than staying home or voting for a third party, Hillary Clinton would have gained 6 points among Republican women who shifted her way while Trump lost those same 6 points, for an overall swing of 12 points among Republican women. Given Republican women’s share of the electorate, Clinton’s overall margin would have risen by nearly 2 percentage points (or 12 points x 0.16). Had that shift occurred uniformly across all states, it would have flipped Florida, Michigan, Pennsylvania and Wisconsin, which would have given Clinton the victory. PerryUndem’s first survey collected responses from any American adults, while the second was restricted to just registered voters. In order to compare the two sets of results, the firm pulled the responses of the confirmed registered voters (1,045 of 1,302 total respondents) from the 2016 survey and compared that subset with the responses from registered voters (1,058 respondents) in the 2017 survey.